Israeli Prime Minister Benjamin Netanyahu on Monday called his Indian counterpart Narendra Modi "a revolutionary leader" who has revolutionised India. "You are a revolutionary leader. You have revolutionised India and catapulting this state to the future. Your visit to Israel was groundbreaking as it was the first time an Indian leader visited," Netanyahu said during a joint press conference with Prime Minister Modi. He said Jews in India have never witnessed antisemitism like in some other countries and that was the testament to India's great civilisation, tolerance and democracy. Remembering the 26/11 Mumbai terror attack, Netanyahu said both India and Israel would fight terrorism together. Earlier today, the two sides also signed nine Memorandums of Understanding (MoUs) in various sectors to further strengthen the bilateral relations between the two countries. Prime Minister Modi and Netanyahu also held delegation-level talks and discussed ways to further strengthen ties between the two sides. 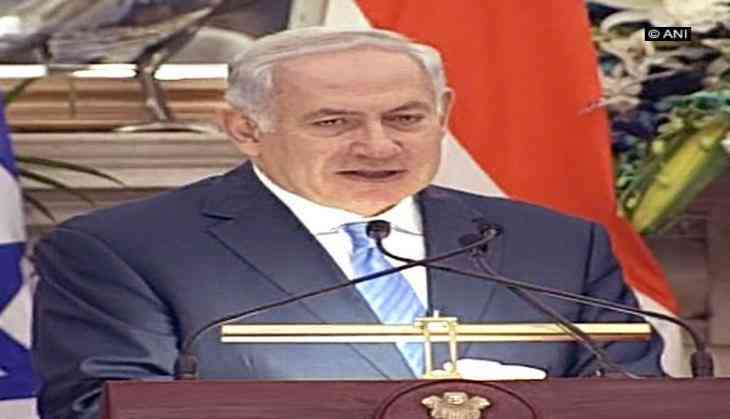 Netanyahu, who is on a six-day visit to India, received a ceremonial reception at the Rashtrapati Bhawan on Monday. Netanyahu will be visiting Agra, Gujarat and Mumbai and will be accompanied by the Indian Prime Minister on extensive portions of his visit.